Growing up is not easy, but u will be fine. Just something that I want to say to my little girl as she takes her first steps into formal schooling. This will be the start of her academic challenges as the rat race starts. But life is not just about school results and eventually, she will go through more experiences, emotional swings and learn about life's lessons along the way. The going may be tough, but I want to tell her that no matter what, everything will turn out fine with God watching out for her and her family to give her support. I dug into one of my favourite lines from Basic Grey's Curio. The prints are so 'peranankan' looking and I totally adore them. 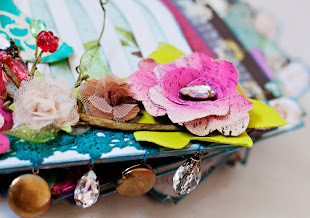 Lots of layering of papers and the fabric rose ribbon is from American Crafts. Its so totally red 'red', you know what I mean? Kind of Christmas-y red but I find it suitable for the prints here. 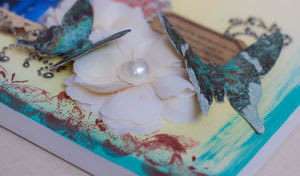 I also cut out the bird cage from Tim Holtz Sizzix Die and distressed it a little using brown copic markers. 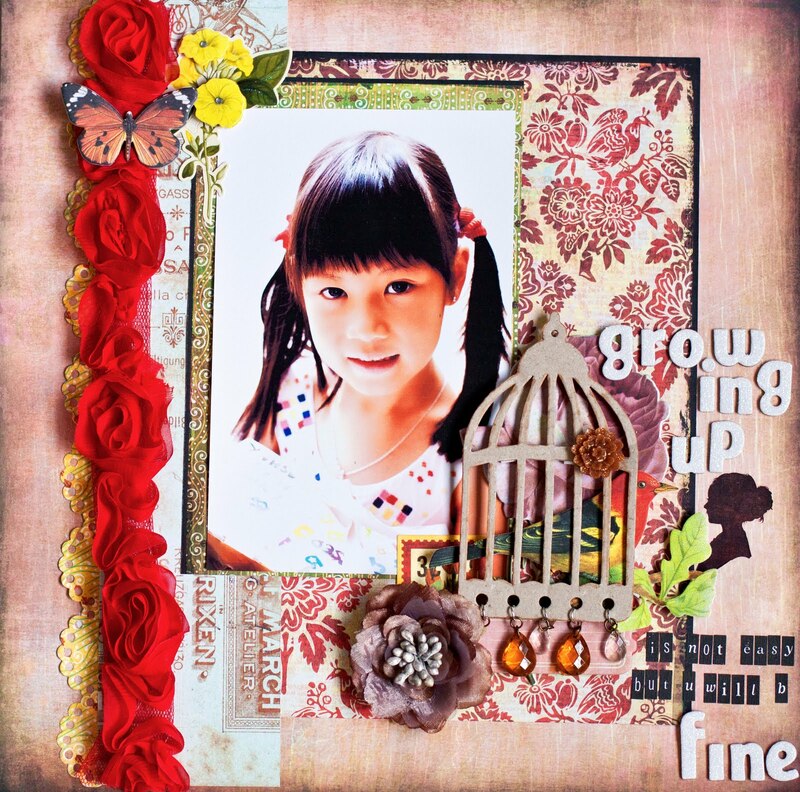 I then added the vintage elements from Making Memories and layered with the chipboards from Curio's line. I intentionally had the the bird out of placement with the cage. Kind of signifying my girl's taking off...hahaha...so corny right? Life is settling into a routine now, but it is indeed tiring to drive out 4 times a day, clocking at least 80km each day. And most times, I have to rush from errand to errand, so driving is indeed driving me crazy and I am EXHAUSTED from all that rush at the end of the day that I can hardly open my eyes...and sadly, I have already gotten two traffic offence summons. I miss my scrapping but will try to complete at least 1 layout a week. I was so happy to attend Iris Babao Uy's class at Made With Love last week. She is so talented, sweet and pretty! It's unimaginable that I actually have a chance to meet my scrapping idol in person and I am really thankful to Swee Ching, Elvira, Sandra and the rest of the Made With Love team for making all these workshops possible...Hopefully, I have some good news to announce in February! 'I miss you so so much......' That is what the little boy will say whenever he doesn't see any of us for some time. Some time varies from 30 mins to 3 hours. Ever since Adah has started Primary 1, the two kids see each other for less than 3 hours on weekdays as both are in different sessions. It is taking the boy some time to adjust to life without a playmate and everytime he picks his sister up from school, this is what he says to her. It makes all of us go soft and even cranky and tired Adah will be nicer to him and hug him. For this week's assignment from Made With Love, we are to feature mediums. I used a paper from Pink Paislee's Parisan Anthology for the background and started by blending in the distressed ink (tumbled glass) for the border.Then I sprayed all over with the Maya Mist (Buttermilk Mist). Definitely lots of fun and therapeutic in a way as you feel the 'woo-sh' from the spray! Lol! I stamped the background ledger stamp onto the paper with Glimmer Glam (Copper Kettle). It gives a nice, shiny, sparkly, look and the details from the stamp are not compromised! As for the swirl from Pink Paislee's Artisan Elements, I embossed it with clear embossing powder before painting it with Glitter Glam (Copper Kettle) and Glitter Glaze (Cowboy). The end result- a light brown with a red/orangy tint. Still enjoying the fun, I decided to swipe lightly Glitter Glam (Copper Kettle and Pink Lady) over the row of white rosettes. Definitely lots of fun playing with the paints and inks and glazes here! Remember to have a heat gun around. It comes in handy when you need a quick drying time. For me, I completed the project in parts over the week cos I was too bushed out from chauffeuring the two monsters from 2 sessions. I lost count of the number of times I drive out in a day to pick them and run errands! And in my impatience to get the the embossing done quickly, I decided to use the hair dryer that was conveniently lying around after the kids' shower and it blew the embossing powder all over my study room and scrap stuff when I switched on to the highest temperature and fan speed! Yikes! Lots of cleaning up after a long day but that's all the part of the fun of scrapping and life! I am sniffing away as I am typing this...It's been a rough start to the new year, with Adah sick over Christmas, followed by Asher and now, me! Adah started primary school on Tuesday and the first day went on fine for her. I was more stressed at the presentations to the parents. The school was already emphasizing on academic curriculum, year-end examinations and continual assessments during classroom learning. However, on the second and third day, Adah cried as I dropped her off and it really broke my heart as she finally confessed that she was nervous and scared around the 'big' school. Friday went on better. I managed to get a better grasp of the new timings and routine and we left the house early and Adah was visibly more relaxed, chatting away to me as I drove. It's really nice to listen to her banter and it makes me feel like we are friends instead of the horrible-disciplinarian- mother and rebellious-stubborn-daughter relationship. I love love love this set of vintagy papers from Graphic 45. The colors are soft and muted and I personally think it's quite a change from their previous collections released in 2010 which were more sophisticated looking and with bright, vibrant colors. 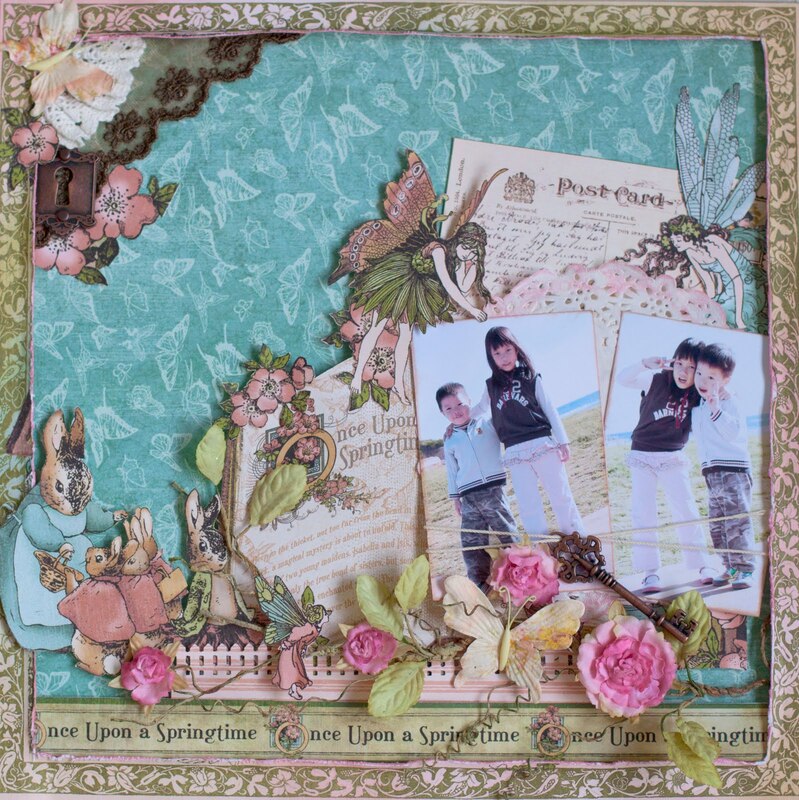 Those little bunnies and fairys are so so so adorable and when I first saw the collection, I knew I would be using it for a 'siblings' layout. I cut out a frame from the papers, as well as the bunnies and fairys, distressed the papers with VersaMagic Chalk Ink in pink and added the Prima twine which matched perfectly in colors! 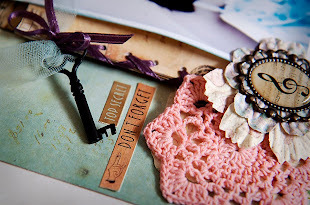 Lots of fussy cutting and I added a Martha Stewart punched out gate, laces and just the keyhole embeliishment from Tim Holtz and the key from 7G.